The Messerschmitt Bf 110 E, was a refinement of the C and D models, beginning production in August 1940. The Bf 110 E was a versatile long distance bomber and heavy fighter. In addition to its ordnance and new gunsight, revisions were also made to the rear machine gun, and inside the cockpit. The most obvious exterior change was the addition of a rectangular air intake on the front of the top gun cowl. 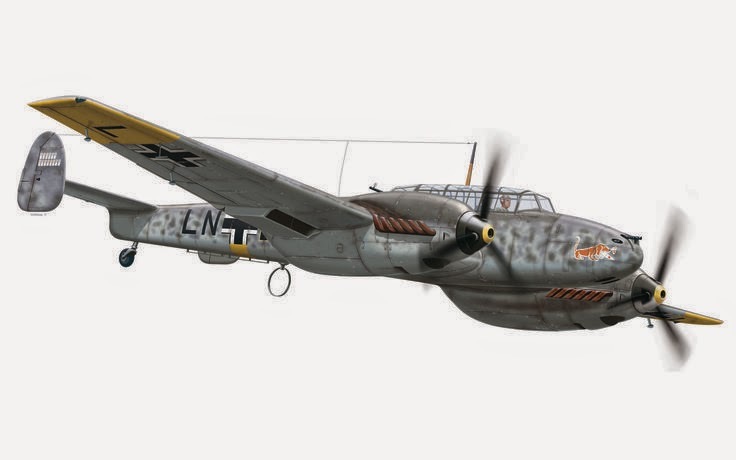 The Bf 110Es were capable of carrying a respectable bomb load of 4,410 lbs (2000 kg) as fighter-bombers, while straight fighter and reconnaissance versions were also built. These, and later versions, were operated with a fair degree of success in many war zones. The production of the Bf 110 was put on a low priority in 1941 in expectation of its replacement by the Me 210. 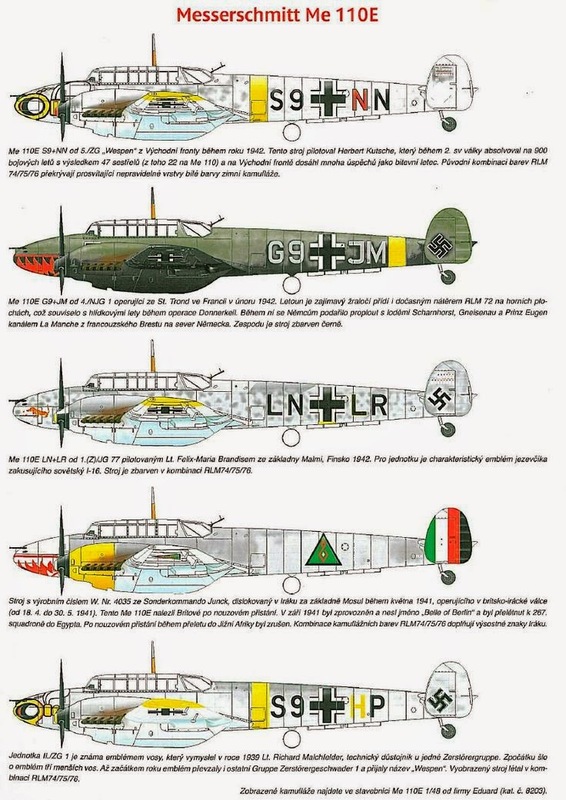 During this time, two versions of the Bf 110 were developed, the E and F models. The E was designed as a fighter bomber (Zerstörer Jabo), able to carry four 50 kg (110 lb) ETC-50 racks under the wing, along with the centerline bomb rack. The first E, the Bf 110 E-1 was originally powered by the DB 601B engine, but shifted to the DB 601P as they became available in quantity. A total of 856 Bf 110E models were built between August 1940 and January 1942. The E models also had upgraded armour and some fuselage upgrades to support the added weight. Most pilots of the Bf 110E considered the aircraft slow and unresponsive, one former Bf 110 pilot commenting the E was "rigged and a total dog." Pre-production version, Daimler-Benz DB 601B engines, pair of ETC50 bomb racks fitted outboard of engines, armament as C-4. Production version of E-0, DB 601P engines. DB 601P engines, rear fuselage extension same as for D-3.